Sharing today the most favorite street food of India ‘ Samosa’. This is not some quick snack, or easy recipes but it is one of the delicacies and need time as well as patience. 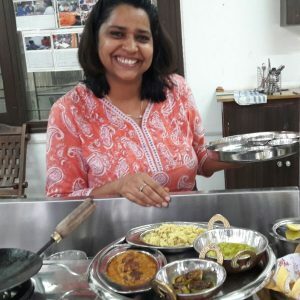 So they say ‘ “What BAKING is to the Western World (in terms of culinary arts), FRYING is to India.” The chefs or cooks who are responsible for fried food section are different in professional kitchens and have expertise of two things : Pastry dough and Deep frying technique. However simple frying may look, it can be very complicated as the temperature of oil can make huge difference in the textures of the final product. So give yourself good time to try the recipe, as there are pre-preparations also involved in the procedure. Test it by pressing the prepared flour in your fist, it should hold its shape for a few seconds. This will have to be done very slowly. Knead it well and put it in container with a lid to rest in a cool area. The potatoes need to be cooled at room temperature before we start making the filling. The temperature of the potatoes is very important as if they are hot when we start mashing them the final product will be like semi solid over soft potato mixture. Peel and mash the potatoes with hand and set aside. Add the mashed potatoes, black pepper, salt, Mango Powder. Roll it into a big Chapati Shape. The thickness of the chapati Disc should be like a cloth. Cut a diameter and you will get to Semi-Circles. Put the line of the sticky flour glue with your finger on the Horizontal line of the Semi Circle. Pick up, stick the straight side by overlapping to create a Cone. Hold it like in between your thumb and index finger like in the picture above. Rub some flour glue and start closing the opened edges, tightly close with the help of two fingers. Put it on a plate with the pointed side up. Complete all the dough and mixture like this.